Finely chop onion and gently fry in olive oil. Add garlic and continue frying. Add pork ribs and continue frying for 10 more minutes. Add half jar of passata and the liquidised tomatoes and leave to simmer for twice as long as a soap opera omnibus. Boil pasta, drain and mix with sauce. In my novel, Truestory, Larry, an itinerant stranger fresh from the pub, claims to make a ‘world famous pasta sauce’ and goes on to demonstrate how to do it. In fact Larry’s sauce is based on the sugo made by my Italian mother-in-law, Rosa, every Sunday for lunch in her flat in Leith. Rosa does not use recipes; she works by sight, taste and smell, so my instructions here necessarily involve some guess work. As a rule there are meatballs too, but how these succulent delicacies come about remains a mystery to everyone but Rosa. Rosa produces delicious meals from a kitchenette not much bigger than a wardrobe from which she pokes her head every minute or two to catch up on the latest soap opera goings-on. She shakes her head at the telly, which is balanced on a great display cabinet full of glasses and ancient bottles of liqueur, and announces: ‘He’s a bad-a man.’ Then she shrugs as though all hope is lost for humanity. She wipes her hands down her pinny, and in despair declares that the sugo is ‘no very good’ this week – which is apparently all the fault of the meat, the tomatoes, the oil, the weather, her health, or any number of other reasons. Then with a glum expression and a: ‘I cannae help it’ she disappears back into the kitchenette to stir the sauce and clatter a few pans. The pasta is served with crusty bread and a tossed salad. When I first joined the family for lunch twenty-five years ago I was told in no uncertain terms that I was eating the salad all wrong. ‘No! No!’ shouted Giuseppe, my late father-in-law, ‘not like that!’ and I was ordered to put my knife and fork down and pick the salad up with a fistful of bread. I did as I was told. Sometimes the meal is served with a glass of Barolo but Rosa thinks Barolo is too strong. She rubs her stomach and says: ‘I cannae help it,’ as she dilutes the rich red wine with a great glug of Irn Bru. 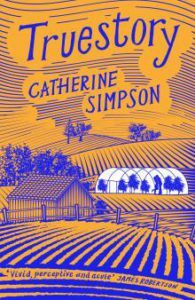 Catherine Simpson has been shortlisted for the Bristol Prize and the MsLexia Novel Award. Her debut novel, Truestory is by turns blackly comic, heart-breaking and heart-warming. It looks at what happens when sacrifice slithers towards martyrdom, and, ultimately, it is a tale of hope. Catherine Simpson is published by Sandstone Press.